Will China go bust with new major illness medical insurance scheme? 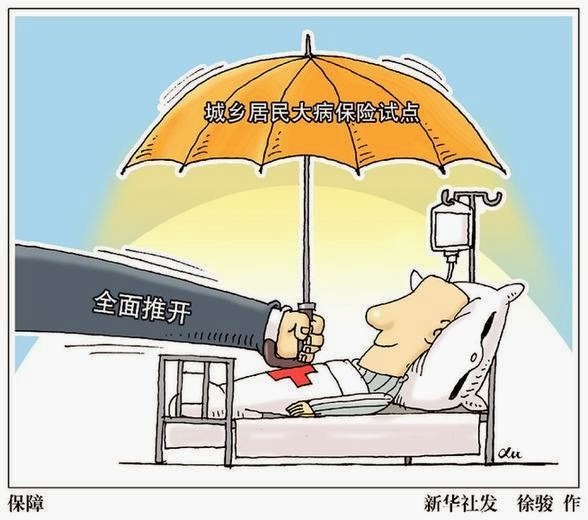 In a major feature in today's Beijing News, health economists warn that China faces many problems in widening its medical insurance schemes to cover serious and catastrophic illness. These schemes will cover major illnesses such as cancer where the large medical expenses can often result in families falling into penury. Serious disease medical insurance schemes are currently being pilot tested in 27 provinces and 130 cities, but experts say the existing schemes are very varied in their operation, have mixed results and are often poorly managed, with little commitment from local authorities. The Chinese State Council has recently recommended that implementation be speeded up and has ordered all provinces to have serious illness medical insurance pilot programs up and running by June. At present, almost 290 million Chinese people are theoretically covered by such catastrophic illness schemes that have funds of more than 600 million yuan. Under existing medical insurance programs the reimbursements for serious illness are meagre and not enough to cover even the most basic costs of treatment. The average reimbursement for urban residents is 258 yuan and for rural residents it is 148 yuan. Health economists say there is a danger that if not managed effectively, a more extensive insurance scheme could simply be like "throwing a cup of water on a blazing woodcart". They point to the widespread 'leakage' in the current medical insurance schemes, in which little of the government funding actually gets to benefit the patient. When the government introduced widespread basic health insurance a few years ago the funding was absorbed by hospitals and practitioners who inflated their fees and carried out unnecessary treatments that would attract reimbursements from the government funds. Therefore experts say that any new scheme must come with strict supervision and conditions to ensure that providers and insurers do not abuse the scheme. Otherwise there is a danger that any such national scheme would become a bottomless pit into which money was poured but with little benefit. They say current pilot schemes have proved disappointing, with many of them being incomplete and incompatible with other schemes in neighbouring areas. Many still offer inadequate reimbursement to patients with serious illness and many are underfunded to provide sufficient benefits. There also needs to be provision for rare and expensive to treat illnesses such as Gaucher's Disease, they warn. Without this, patients and their families will still face ruinous expenses when someone becomes ill.